Back in March, Medicom revealed updated versions of their of Daft Punk Thomas Bangalter and Guy-Manuel de Homem Christo figures based on their “Human After All” appearance. These “Version 2” figures featured improved the clothing materials, body types and sculpting of their modern Real Action Heroes line. 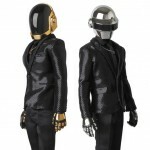 Now they have revealed new Daft Punk figures based on their look for the “Discovery” album. Along with the new body styles, the figures feature LED light up functions in their helmets. The figures will be priced at 26,800 Yen each (about $253) with a release set for May 2017.Toyark sponsor HLJ has them a little lower at 24,120 Yen ($227.48) each. You can order them Here and Here. See the new images by reading on. Medicom has released a few new preview images. The new photos show a surprising new slate of figures based on iconic Stanley Kubrick films! They will be producing an Alex Real Action Heroes (RAH) 12″ Scale Figure from A Clockwork Orange. That figure is due in March 2017. They are also releasing Orange and Yellow Space Suit MAFEX Figures from 2001: A Space Odyssey. These figures are scheduled to be released in February 2017. 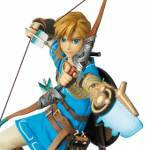 Medicom has released official photos and info for all of these figures. After the jump, you can check out the new photos as well as more details on the figures. Back in 2006, Medicom released a set of Daft Punk Thomas Bangalter and Guy-Manuel de Homem Christo figures based on their “Human After All” appearance. Since then, Medicom has improved the clothing materials, body types and sculpting of their Real Action Heroes line. So they are releasing an updated version of these Daft Punk figures, with more realistic and authentic helmets, newly tailored outfits and using the newer body type. 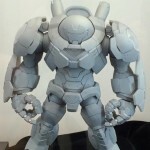 These 1/6 scale figures will include interchangeable hands and figure stands. The figures will be priced at 22,000 Yen each (about $195) with a release set for December. You can see the new images by reading on. 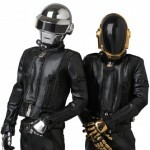 Medicom has released images and info for a new pair of Daft Punk 1/6 Scale Real Action Hero (RAH) Figures. 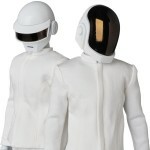 This time, Guy-Manuel de Homem-Christo and Thomas Bangalter are in their white suits. The pair wore these at the 2014 Grammy’s when they won album of the year for “Random Access Memories“. The figures will stand just under 12” tall and will include figure stands. The figures are scheduled for release in March 2016 at a price of 20,000 Yen each (about $163). Medicom is releasing a new set of Daft Punk Real Action Heroes. 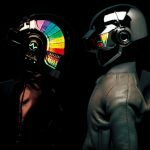 These updated versions are based on Guy-Manuel de Homem-Christo and Thomas Bangalter from their most recent album, Random Access Memories. These 1/6 scale figures stand at 300MM tall (just under 12″) and will include fabric outfits and figure stands. The figures will sell for 18,800 Yen each (about $156 USD) with a release set for May. Big Bad Toy Store has a pre-order for the set of both figure for $389.99.